At the JavaOne Conference Sun Microsystems has announced the release of version 1.2 of its rich internet application framework and language – JavaFX. Numerous features have been added, including skinnable UI controls, better layout, local data storage, RSS/Atom feed support, chart support, improved dialogues and remodelled event processing. Also of note is that JavaFX 1.2 now officially runs on Linux and Solaris. 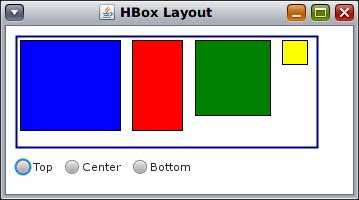 I’m happy to see many more UI controls included in this latest release of JavaFX, most notably ScrollBar, which is so painful to re-implement yourself. JavaFX is a rich client platform for building cross-device applications and content. 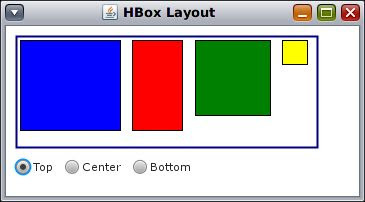 In the following I will demonstrate JavaFX script, the programming language for JavaFX there I use JavaFX as a short form for JavaFX script. 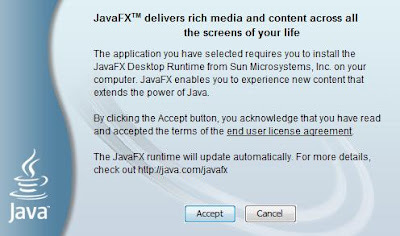 JavaFX Script is a new programming language from Sun for creating rich media and interactive content which is tightly integrated with Java, as the name indicates. With JavaFX it should be easy to develop Rich Internet Applications (RIA). 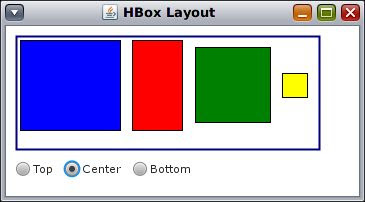 JavaFX is a compiled language the result of the compilation is Java byte code. It is also a statically typed language which means that the data types of each variable, return value, etc. is known at compile time. JavaFX is also a declarative language, e.g. you describe what the application should do, rather then specifying the control flow of the application yourself. The language also provides data binding to connect UI elements directly with model elements. 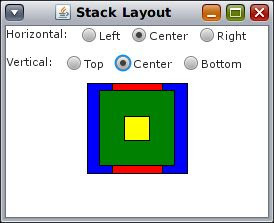 I took a look at JavaFX 1.0 not long after it was released in this article. Two years have passed, and JavaFX has reached version 1.2, just released with significant changes to the language and the API. Applications created under JavaFX 1.1 must be recompiled and may need minor alterations. 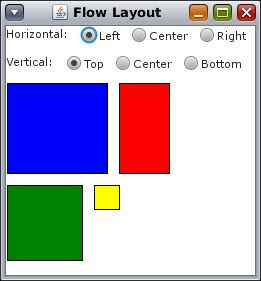 The basic nature of JavaFX continues to be creation of GUIs (Graphic User Interfaces) in a declarative language format that defines interface components from Java's well developed "Swing" interface toolkit plus a variety of display effects including animation, vector graphics, audio tracks and video, all running in a Java JVM. Many of the new features in 1.2 are related to flashy display effects. 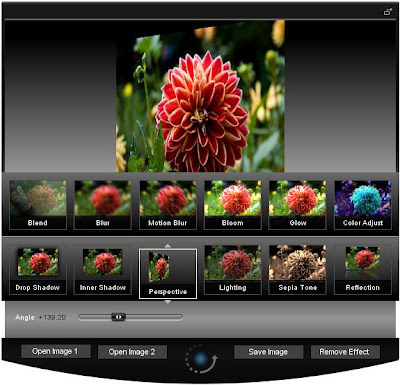 There are also significant additions which will be useful in accessing Web services. The JavaFX language creates computation functions in a style familiar to Java programmers, with classes extending base classes and implementing interfaces. Version 1.2 brings a new feature which may surprise you: the "mix-in" class declaration modifier. A mix-in class cannot be instantiated directly, rather like the java "abstract" class, but a custom class can extend any number of mix-in classes. Java has insisted on single inheritance in the class hierarchy. If you want multiple inheritance, here is your chance to try it. I wonder if mix-in may make it back to standard Java! Stage infrastructure enhancements, including Screen class and Alerts. Direct referencing of Java arrays. Mixin inheritance and the elimination of multiple inheritance. The BoxBlur effect — nearly 20 effects are available now! Improved asynchronous processing model, extended by API classes that require it — for example, HttpRequest. The Math and Properties classes. New layout classes and improved support for creating custom layouts. 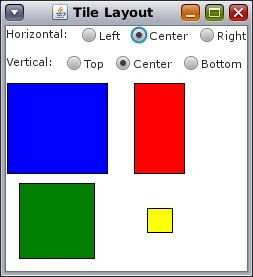 More skinnable or CSS-styled controls, and improved support for creating custom UI controls — for example, the Behavior class. RSS and Atom feed support. Charting support, including Area, Bar, Bubble, Line, Pie, Scatter, and X/Y. In javafx.async package old classes are rem,oved and 3 new classes namely, JavaTaskBase to provide running classes in thread outside EDT, RunnableFuture(the name explains it all), and Task class which a way of starting, stopping and tracking code that does not run on the JavaFX event dispatch thread(straight from the docs). a new package javafx.date.DateTime which provides support for proleptic Gregorian calendar (the pure Gregorian calendar with no Julian-Gregorian transition). Finally some real JavaFX components. 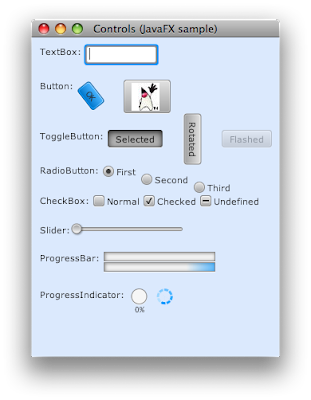 No wrapped Swing components, but full JavaFX components. The most important components are now included, such as a scrollbar, sliders, progress bars and a list component. Still basic (no fancy datagrid for example), but enough to be used seriously. All of the components are supporting CSS, which enables you to easily change the look & feel of your application just using standard components. Besides all the standard components, some charting components are available. Again, all fully supporting CSS, and the API looks nice you use. 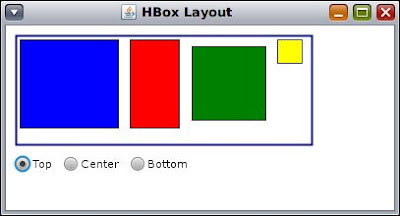 The lack of layout managers was another important problem in the previous release. You were basically left calculating sizes and positions manually which is not very pleasant. First of all the way component sizes are calculated by a container is improved. 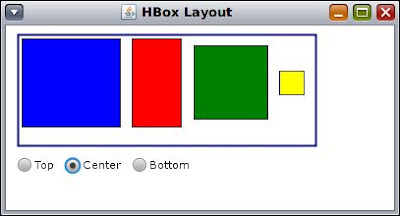 Next they created some standard layout components. The containers are still simple (compared to the Swing layout managers), but they do the basic magic that's required for most applications. 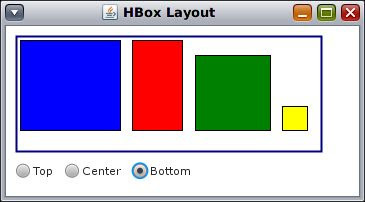 I was also happy to hear that the HBox and VBox are now working properly, which have cost me a few too much hours working around in the previous release. 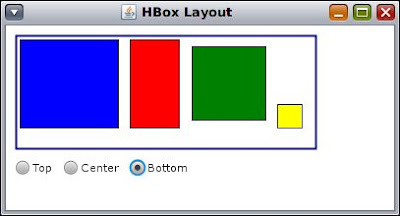 My first tutorial was the "Getting Started With JavaFX Technology" which can be found here. Its more than just a "Hello World" introduction which is kinda refreshing sometimes although I'm famous for doing "Hello World" samples. 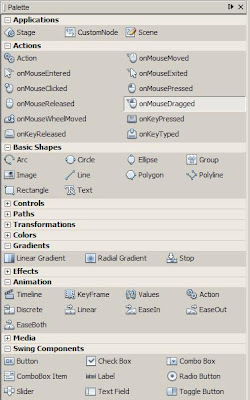 The tutorial does a good job of showing off some of the power JavaFX holds. I ran into no problems with the code or tutorial and had it coded and running in about 10 minutes. My only gripe is the the placement of the braces (perhaps this can be changed but I couldn't find a way). Overall though I enjoyed the experience of going through this tutorial (and others) and I liked the ability to drag off items from the palette and drop them into the code. It greatly sped up my time creating the tutorial projects and it of course ensured I had the syntax correct as well as the capitalization. 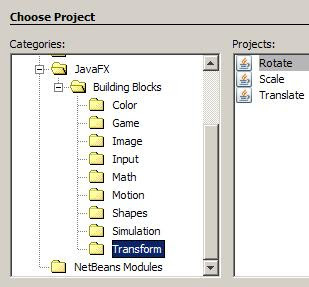 For developers wanting to simply go for the code samples in working projects rather than working through the numerous JavaFX tutorials there is the option to go into Netbeans and select: File -> New Project and then navigate to the Samples folder and then into the JavaFX folder. Here you'll find a good number of samples that go from beginner to more advanced levels. Also keep in mind there are several good screencasts if you prefer that method to learn new technologies. Overall I'm impressed with the amount and quality of tutorials/documentation for JavaFX, its one of the better documented developer technologies out there with no lack of tutorials. JavaFX's niche might just end up being putting RIA front ends on existing or new Java back end systems. I don't know of course, but it seems like that is a good fit for it and its UI capabilities. 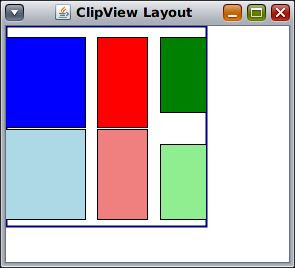 If I've piqued your interest in JavaFX then stay tuned to this blog because I will be putting up some more articles/tutorials on it in the future. I definitely had a much more pleasant experience with JavaFX than I was expecting, that said though I have to wonder where JavaFX will find it's market? Its coming late to the market compared to Flash and even Silverlight but then again it seems to have a thriving community and above all some excellent documentation and of course free tools. I'll be curious to see how well JavaFX is adopted not just by developers but end users and companies as well. 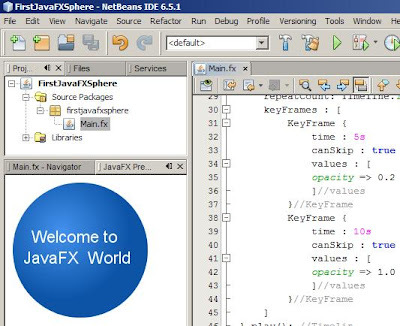 As with previous releases of JavaFX, you can get a combined download of the NetBeans 6.5.1 IDE plus the JavaFX release. 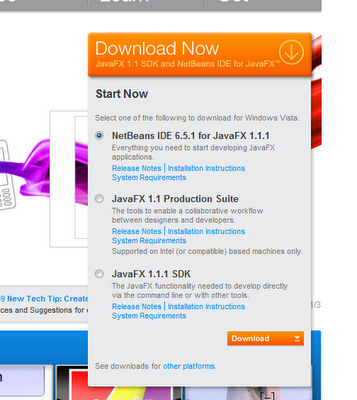 You can also download just the plug-in if you already have the latest NetBeans installed. 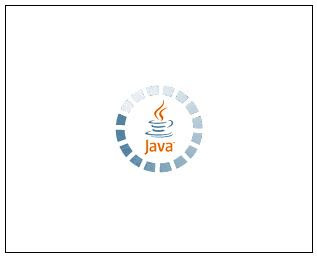 Although one Sun Web page says Java JDK 5 is sufficient, this page says JDK 6 update 13 is the minimum for developers and update 14 is recommended. In addition to Windows (XP or Vista), Mac OS X is supported while Solaris and Linux versions are still in beta release.